Russian translator services: the costs constantly vary depending on the project. Regardless of the scope, there are a few steps you can take to keep expenses to a minimum. Beyond quantity (the bigger the project, the bigger the discount), turnaround (rush charges), translation memory tools, there are several other ways to save on English to Russian translation services. 1. Avoid translation companies and agencies, look for professional freelance Russian translators. Translation companies and agencies are organized businesses whose primary activity is to coordinate and provide a range of translation-related services. Due to this, they have got quite big business expenses. As a rule, English to Russian translation companies pass those expenses on to their customers. Therefore, a customer will have to pay for Eng Rus translation services, management staff, office rent, etc. On top of that, there is always a risk of getting the poor quality of English to Russian translation. In order to compete in the English to Russian translation market, some companies may quote lower than a professional freelance English to Russian translator. That means, either it didn’t find the best Russian translator and hired a cheaper one, or it will pay the Russian translation service provider less than she or he requires, affecting the quality of the work. 2. Get your company’s content translated by an experienced freelance English to Russian translator. My next tip for a successful cost-effective Eng Rus translation project would be to choose professional English to Russian translator services from the start, rather than entrusting your project to unqualified or inexperienced translators. Of course, it might be tempting to hire cheap English to Russian translation service providers or to ask your bilingual employees to translate English to Russian and complete the work in order to save money. But keep in mind, using unprofessional mediums to translate from English to Russian might be very expensive in terms of the damage to your brand or reputation, and it can also mean spending more money and time-solving problems, for example proofreading a badly translated document. You can outsource freelance Russian translators through Google search, social media networks, Proz.com, Upwork and Fiverr. 3. Get your book translated by a professional Eng Rus translator for free. Babelcube platform provides an easy way for publishers and independent book authors to partner with translators. Authors just need to open an account on the platform, set up their profile, upload a manuscript, book description and some other details and wait for some magic to come. The platform works on a royalty sharing model. The authors do not need to pay anything to the translators upfront. They have to share most of the royalty with the translators until the book sells a few thousand copies. That’s only fair since they did all the work of Russian translation. After that, the ratio changes and you get most of the royalty. 4. Get high volume less-essential text processed with MT post-editing services. Not every word of the text holds the same business and commercial value. For example, high volume internal communications, inbound queries and notifications, basic user manuals, forum posts, content for a general audience, online help, customer support, etc. In response to these market demands, an English to Russian translator can offer you MT post-editing services which cover the process whereby humans edit machine generated Eng Rus translation to achieve an acceptable final text. As the field of MT is relatively new, payment issues for post-editing are still under research. As a rule, it is to measure the time necessary to meet the required quality. 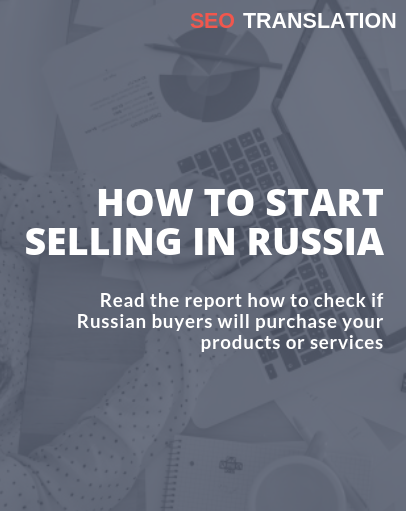 Currently, a Russian translator negotiates his or her own pricing as each project depends on such factors as the quality of the source document, the quality of the MT output and the source and target languages. But in any case, it is much cheaper than human translation. 5. Get your text crowdsourced from English to Russian at low rates. Another idea to cut costs on Russian translator services is crowdsourcing translation. The idea behind the crowdsourcing Russian translation is to assign Eng Rus translation projects to a crowd of translators rather than a single translator. The concept of this approach is similar to the MT post-editing. Companies crowdsource less-significant content to translate it into Russian. In most cases, they do this because the risk is balanced with benefits such as speed and low cost. There are many website translation crowdsourcing services out there that are ready to take on your project. E.g. Smartling, Gengo, Get Localization, Transifex, Ackuna Cloud Translator, Lingotek, OneSky. Hanna, thank you for the great post! Unfortunately, those post-editing tools (at least, Grammarly) do not support Russian. So, they might be useless for a customer ordering translation or MT editing into Russian. Correct me if I am wrong.